Greetings Funny Names Fans! Today I’m celebrating a milestone—five years of contributing to this wonderful blog. So what better way to celebrate than revisit my first post on the BoFN. Without further ado, take it away Fannie of five yester-years ago. Chicken, Alaska, not to be confused with Baked Alaska, is a town of no large proportions and a delicious name. There may be other cities in the US in which Chicken appears in their name, but none so elevated as Chicken, Alaska, located just north of the 64th parallel at 1,621 feet. Sandwiched between the the towns of Eagle and Tok (pronounced Tōk). I’m making no judgement here but the brownies may be delicious. Settled in the late 1800’s by gold seeking miners near the south fork of the 40-Mile River before the Klondike Gold Rush. With a scarcity of food back then they took up eating the ample Ptarmigan, Alaska’s state bird, which looks something like a chicken. Not to be confused with the Pukeko of New Zealand, which also starts with a “P” and looks something like a chicken but I digress. In the beginning residents wanted to name the town Ptarmigan but couldn’t agree on the spelling. Nor did they want the name of their fair town to be an embarrassment. So when they incorporated in 1902, they choose the name Chicken. They’ve made the most of it ever since. Depending on who you ask, there may be between 6 and 37 year round residents. There’s no electricity (except by generator), no phones, no internet (they have a website but it’s managed outside of Chicken) and no central plumbing. I’ve used their public outhouse, the Chicken Poop. In the local vernacular, it’s a “four holer” and you don’t have to cross the road to use it. Now this is the ultimate in marketing. 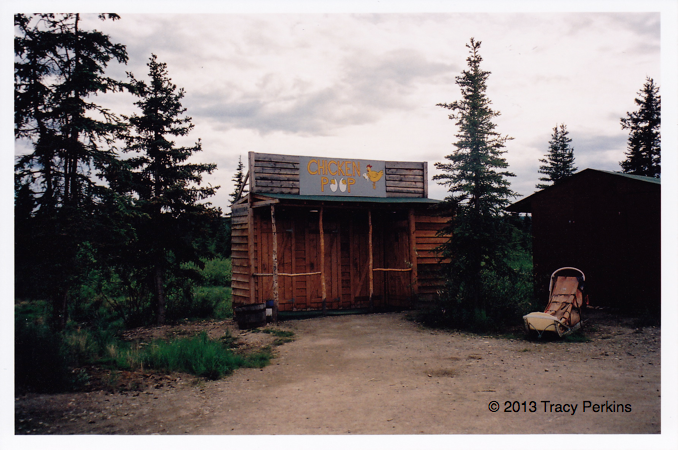 The main street boasts The Chicken Post Office, Chicken Liquor Store, Chicken Saloon, Chicken Mercantile Emporium, (where I purchased a copy of Outhouses of Alaska, a must read for any outhouse user), and Chicken Creek Cafe, which I probably should have mentioned before the outhouse. They keep the mascot chickens between the cafe and saloon. However, there was no sign explaining which came first. . . Some things you just have to see for yourself. To get the cluck to Chicken try traveling on the gravel paved Turner Highway, pot holes included for your driving pleasure. Then there’s the Chicken Airstrip, if you prefer to travel where Chickens don’t fly. I doubt they call it the Chicken Strip. There may be fifty ways to leave your lover, but there’s only two ways to get to Chicken. For some fun reading, check out the Chicken Alaska Not So Frequently Asked Questions. It’s a hoot or is that a cluck? Many thanks to Dave, Rob and Arto for inviting me to join the world of funny name appreciation. 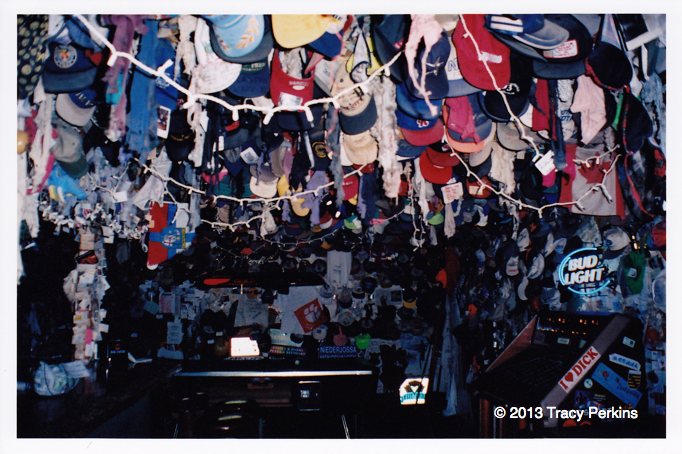 Tracy – Fannie Cranium’s Guide to Irreverent Wisdom. Please consider donating to our founder, Dave, and his fight against a cancerous brain tumor, all while he goes to medical school to learn to fight the very thing he is battling. This entry was posted in funny place names and tagged funny names, Hot Chicks, humor, humour, travel. Bookmark the permalink. 9 Responses to Chicken Alaska, Doesn’t that Sound Delicious? Revisited. Celebrating my fifth anniversary over at the BoFN. Join me in celebrating. congrats – 5 years! hope there are many more to come and i love this throwback, it’s clear, you always had such a clever and funny mind. LOL. Having driven on several of Alaska’s “highways”, I hope neither of us has to swerve, most of them don’t have shoulders. Congrats, T! Cannot believe how quickly that “flew” by. Thanks, L! Who would have guessed your coaching me on blogging “oh so many years ago”, would have led to this. Thank you! Oh, clever Fannie. I must be feeling “peckish” bc all I see as I read this is questionable brownies from tokers, parmesan chicken but not Ptarmigan, Klondike bars, and baked Alaska. Oh, so THAT’S where the tokers come from. I see your Paul Simon and raise you a Steve Miller. Doesn’t it just figure in a town with fewer residents than any of my son’s high school classes, that they’d still make sure to have a liquor store and a saloon? I will have to belly up to the bar if I’m going to see your Steve Miller. lol. Aside from being very hungry now that I’ve read your comment, I agree, it did seem odd to have a liquor store and saloon. With that said, their main income is derived from tourism and guided hunting parties.